What is a beer growler? Our beginner's guide shows you everything you need to know, including sizes and tips on creating a custom growler of your own. So, what is a beer growler, exactly? 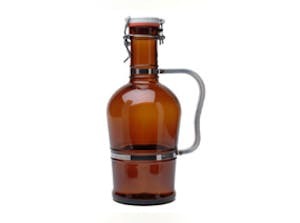 Well, for all you aspiring brewers out there, a beer growler is a special container traditionally used to transport draft beer or other beverages like cold-brew coffee and, in some cases, wine. Though the origins of the container are shrouded in mystery, the term 'growler' is said to have originated as a reference to the sound emitted from the bottle as a result of carbon dioxide escaping from the brew held inside. For brewers, the recent rise of craft brewing in the US means beer growlers have become an increasingly popular way for customers to transport beer purchased from local breweries. As a result many brewing companies have started offering growler refill programs, where patrons can bring washed beer growlers back to the brewery for guaranteed refills at a reduced price. What Materials Can Beer Growlers Be Made Of? Although glass growlers are by far the most common for holding beer, stainless steel growlers have recently become more popular due to their durability, portability and ability to keep beer fresher for longer periods of time. While ceramic growlers are also available, their sturdiness and pricing generally makes for more of a niche or specialized promotional product. 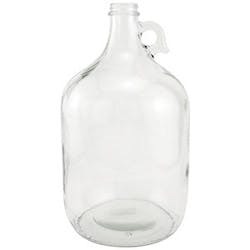 In Terms of Growler Size, What Options Are Available? Amber or Clear Beer Growlers? 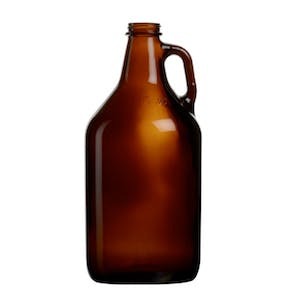 The two most popular colors for beer growlers are amber (a brownish hue) and clear (also known as "flint"), with clear growlers typically costing 25-35% less than the amber ones. One noteworthy benefit of the dark amber glass, however, is the protection it offers from ultraviolet (UV) rays, which can often spoil beverages and lead to an unpleasant odor and taste. 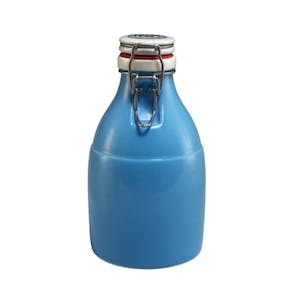 While beer growlers are available in other colors (such as green or cobalt blue), these types of growlers tend to be more difficult to find and often need to be custom manufactured. What Type of Beer Growler Closures Can Be Used? Beer growlers usually come with one of two different types of closures: a screw-cap or a flip-top (also referred to as a 'swing-top'). 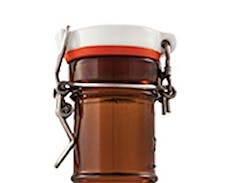 While screw-cap growlers are more prominent than flip-top growlers - and therefore less expensive - many brewers find the "classic" look of the flip-tops to be more aesthetically pleasing overall. Additionally, flip-top growlers are generally more difficult to print on than their screw-cap counterparts. The caps themselves can be made of either plastic or metal, with metal caps being slightly more prevalent, which is most likely due to the slightly higher cost of the plastic caps. For those brewers using plastic closures, the typical rationale tends to be convenience and freshness. From a practical standpoint, there's not much difference between screw-caps and flip-tops. While flip-top growlers are much harder to print on, most breweries tend to prefer a "classic" appearence over more generic-looking screw-cap beer growlers. 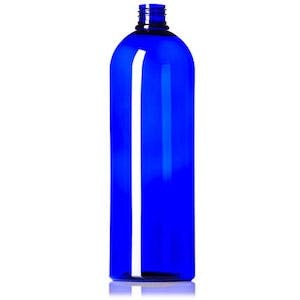 Regardless of which type of closure you choose, both flip-top and screw-cap growlers should be cleaned between refills. Assuming that's done, your beer should stay equally as fresh with either type of closure. For more on the differences between screw-cap and flip-top growlers, check out this Q&A. Do Beer Growlers Come In Different Shapes? Variations of the standard beer growler include smooth or ribbed glass, barrel or traditional shapes and a wide range of handle styles including metal handles with uniquely ornate designs. 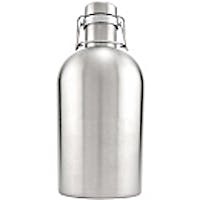 For 64 oz growlers, the typical height tends to be between 11-12 inches with a five-to-six-inch width at the base of the countainer, although these measurements can sometimes vary. While glass handles are most common, metal handles (including ones with more intricate motifs) are also available. 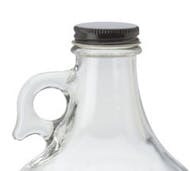 Some growlers don't have any handles at all, which is especially common for beer growlers smaller than 64 oz, particularly those with Grolsch-style flip-tops. The majority of 2 liter growlers tend to look different from other more "standard" looking growler shapes and sizes. These 2 liter beer growlers typically have a metal or hanging-glass handle, as well as a flip-top cap, like the one pictured on the left. What About Custom Growlers? Can You Imprint or Etch on Growlers? The most common way to create custom growlers is to place a brand logo or other artwork onto the glass surface of the containers. This process is also known as screen-printing. Etching, on the other hand, involves carving a design into the glass itself, resulting in an image that has a "raised" appearence. In terms of cost, etching is far more expensive, with the price of deep-etching a single growler ranging from $2 to $4 per unit. The cost of etching can prove prohibitive at scale, which is why screen-printed growlers tend to be most common. When imprinting artwork onto your custom growlers, it's important to provide the printer or supplier with either an image of the artwork, or at least specify how many colors the imprint will include. Many growler suppliers will often throw in a one-color imprint with the total cost of the growlers for large orders, then charge an additional fee per growler (usually <$0.90) to add a second color to the artwork. Some suppliers may also charge a setup fee for the custom imprint on top of the per growler imprint cost. For more on etching vs. imprinting your custom growlers, click here. What Are the Typical Quantities for Wholesale Beer Growlers? For wholesale growlers, the minimum quantity is generally either 1/2 gross or 1 gross, with 1 gross = 144 growlers). For 64 oz growlers, a case is usually considered to be 6 growlers in total, with a pallet containing roughly 504 growlers. For a 32 oz growler, a case is generally regarded as 12 growlers, with pallets containing anywhere between 800-1200 growler bottles. How Much Do Growlers Typically Cost? How To Get The Best Price For Growlers? When negotiating with a growler supplier, it's often more economical to condense your order into as few shipments as possible to save on shipping costs, which can be significant. For example, rather than having five separate shipments of 100 growlers each, it might make more sense to have a single shipment containing one pallet of beer growlers. Looking for more info on beer growlers or considering investing in custom growlers for your brewery, winery or coffee business? Check out our guide to custom growlers here. When you're ready to buy, submit a free request for quotes to get prices and information from multiple suppliers at once.